Male pattern hair loss (androgenetic alopecia) is the commonest cause of hair loss in men. It usually starts in either temple and gradually progresses to the classic bald pate. It is now known that a hormone called dihydrotestosterone (DHT) which is converted from the androgen (or hormone) testosterone by an enzyme is responsible for the gradual effect of male pattern baldness seen in some men who are genetically more susceptible to DHT. Male pattern hair loss can also occur in women, although this is rare. More commonly women experience a diffuse hair loss where there is general thinning of the hair to a greater or lesser extent in all areas of the scalp.This can be due to several different factors, including trauma or stress, hormone related disorders, excessive dieting, and certain diseases or drug treatments. Most women lose some hair a few weeks to three months after childbirth. This is a normal physiological event and the hair subsequently re-grows rapidly. Alopecia areata can occur in both men and women, and is a common disorder in which hair growth suddenly ceases in circumscribed areas. It most commonly occurs on the scalp (but it can also affect the beard in men) and several such bald areas may appear together. The outcome is unpredictable, but in two thirds of cases involving small bald areas recovery can spontaneously occur after a few weeks. It is advisable to consult with your G.P. or a doctor specialising in the treatment of hair loss before embarking upon any treatment. Twenty years ago, non-surgical hair addition or replacement would have been a wig or toupee. More sophisticated alternatives of this are available today and are often marketed as hair extensions, hair weaving, and hair prostheses, where artificial hair is added to the existing hair or scalp. This may be one of the only options available to people who have very extensive hair loss, but can be detectable from the wearers own growing hair and require a lot of daily maintenance. You may come across advertisements promising hair re-growth, or discovery of a new technique or “cure” for baldness. The options that we have researched and outlined below are non-surgical or surgical procedures that have medical evidence to support their results and are used by many clinics in the U.K. today. Hair transplant or hair restoration surgery for hair loss involves the surgical transplantation of small hair grafts, which produce quite natural looking results and are often indistinguishable from normal hair. Non-surgical hair replacement systems, also known as hair bonding or hair integration allow you to sleep, shower, swim and carry on with your life as if you had your own hair. For many years, scalp flap surgery was used by plastic surgeons for the treatment of hair loss after serious scarring had occurred. It has been used for treating male baldness since the early 1980s. 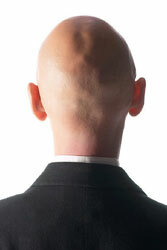 The most common treatment for male baldness is hair transplantation. However, if you have already lost too much hair, scalp reduction surgery can reduce the scalp size to make you look less bald. Click for ALL clinics in the UK & Ireland treating Hair Loss ( Male Pattern Baldness, Alopecia ) registered and verified by Consulting Room.